2 nights in Italy in the shadow of the Monte Viso. 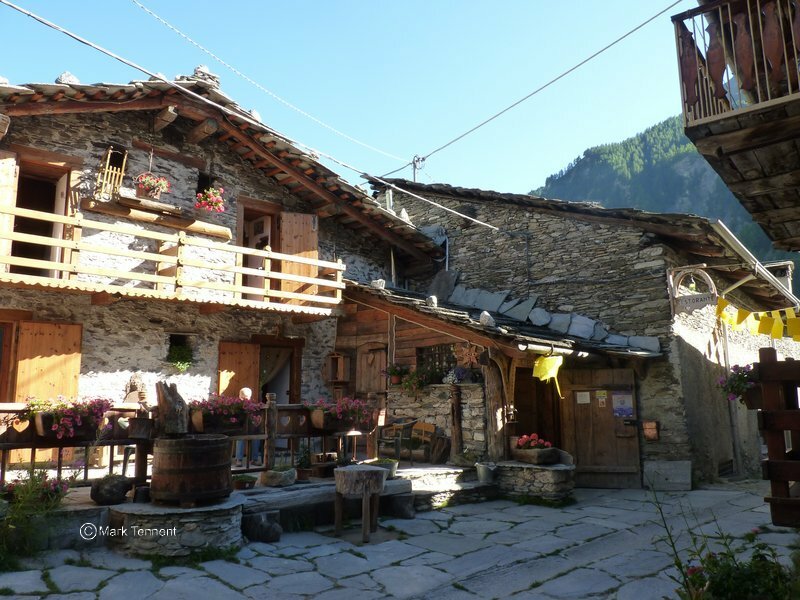 The Queyras is a quiet, unspoilt haven in the French Alps abutting Italy. Discover a flora and fauna with a Mediterranean influence. Our Tour of the Queyras starts at the village of Chateau Ville-Vieille (1377m) in the Guil valley. A gentle first day takes us to St Veran (2100m), the highest inhabited village in France. Chalets of wood with stone tiled roofs. Sun dials adorn the walls. You will have the chance to savour Italy twice. 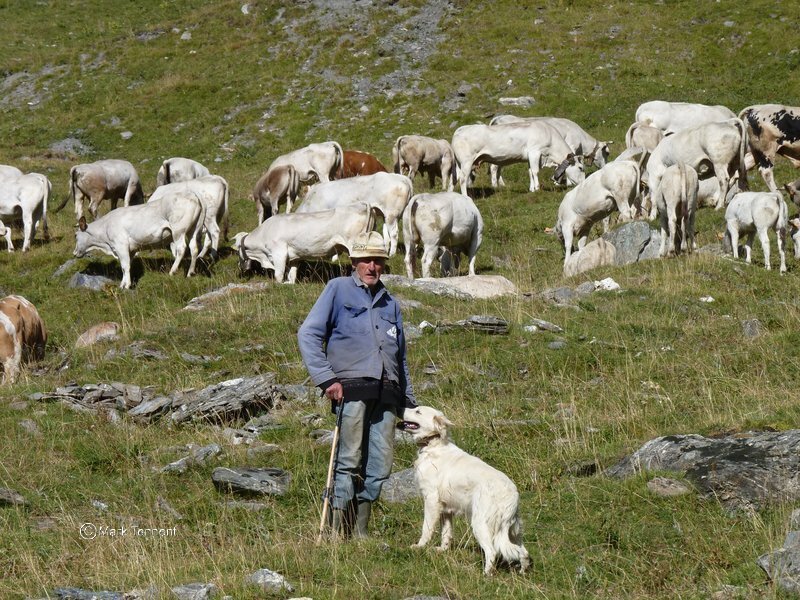 You can explore the picturesque village of Chianale and then later you will discover the Ciabot del Pra in the Val Pellice and the Refuge Jervis. 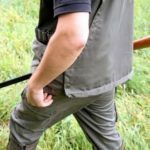 The Queyras really are a “hidden gem” as many people have never heard of them. 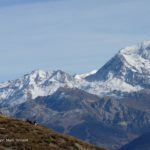 The Queyras lies south-east of the town of Briancon nestled between the Durance valley and the Italian border where the peak of Monte Viso dominates the skyline. To the west is the Ecrins National Park with several peaks over 4000m. The Queyras in the past was an area difficult to access. Its remoteness and relative inaccessibility has helped to preserve it. It has remained unscathed by mass tourism. Coming from the North there is the Col d’Izoard, made famous by the Tour de France, and shut in winter at 2360m. The main access is from the west and the town of Guillestre. From Guillestre you can reach the villages of Ceillac and and the Guil valley with villages such as Chateau Queyras and Molines-en-Queyras. Chateau Queyras is named after the medieval castle that protected the area from people coming from Provence. The Queyras become a regional park in 1977 to preserve its natural environment and local heritage. Ancient irrigation channels traverse the fields give testimony to man’s endeavours to provide a living from the land. Hayfields are still cultivated up to 2000m. Our Tour of the Queyras will see us walking through forests dominated by larch trees. Larch make up 60% of the forests in the Queyras. Wildlife abounds in the Queyras including the “mouflon”, originally from the islands of the Mediterranean. You may also expect to see ibex and chamois. Transfer from Lyon Airport / TGV station. Accommodation: Hotel**. 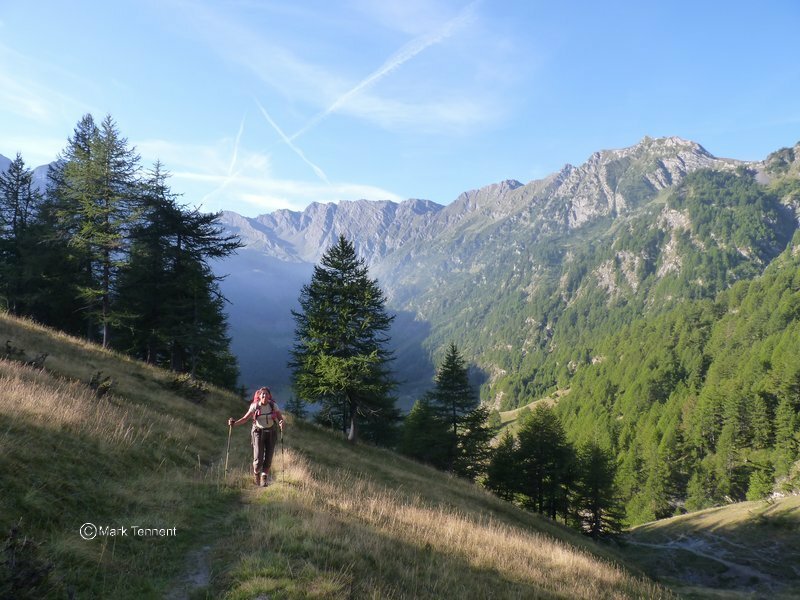 Our first day slowly climbs the valley of the l’Aigue Blanche following old irrigation channels that contour the hillside. We pass through the small village of Pierre-Grosse before reaching Saint-véran one of the highest villages in France. From St Veran we cross the river and then ascend gently along it’s bank passing the refuge of Refuge de la Blanche. From here we climb to the Col Blanchet (2900m) and the border with Italy. 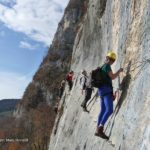 A descent takes us down to the small village of Chianale. Leaving Chianale we climb to the Col Agnel and the frontier once more. We traverse around to the Col Vieux (2850m) beneath the Pain du Sucre (3208m). 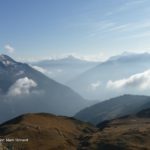 A wonderful descent by the valley of the lakes and thence down into the Guil valley and a small hamlet at the head of the valley. A shorter day today as we cross the Col de Lacroix (2300m) and old border crossing route. 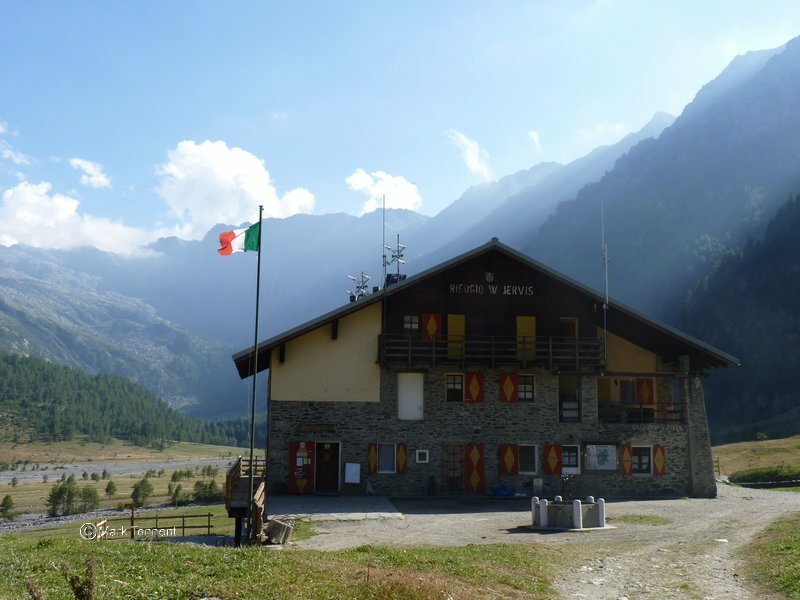 We spend the night in an Italian Alpine Club refuge in the hamlet of Ciabot del Pra. We re-cross the border into the Queyras by the Col d’Urine (2500m). Arriving at the col we gently descend through, at first, alpine pastures and then through larch forests to the village of Abries. Leaving Abries we climb steadily to the Lacs du Malrif (2500m) one of the largest lakes in the Queyras. We pass by the old abandoned villages of Malrif and Lombard before a descent that takes us to the village of Aiguilles, the “capital” of the Queyras. Celebratory meal in Aiguilles. After breakfast transfer to Lyon airport and TGV station (co-located). The following is a summary of the tour information. For further details please contact me. Accommodation: Hotel – 2 nights; Huts (shared dormitory type rooms) and Gites (twin rooms / multi-occupancy). 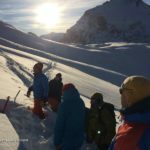 Hut fees: including dinner, bed and breakfast, picnic lunch, showers. Hotel accommodation on the first and last night of the tour. Group transfer from and to Lyon airport / TGV station.